I’ve had a hell of week at work it is the full moon syndrome as I call it. I do the IT at work supporting 3 branches 4 remote people and the travelers who are in Asia. Anyway I had planes for a couple of chicken thighs but was pretty burnt when I arrived home so I quickly pan seared skin side down for about 4 minutes and turned over and placed pan and all in a 350 degree oven for about 30 minutes. Lyn had made some couscous so that was my side. Quick and easy and good. I love that crispy chicken skin, ya I know no veggies tonight. 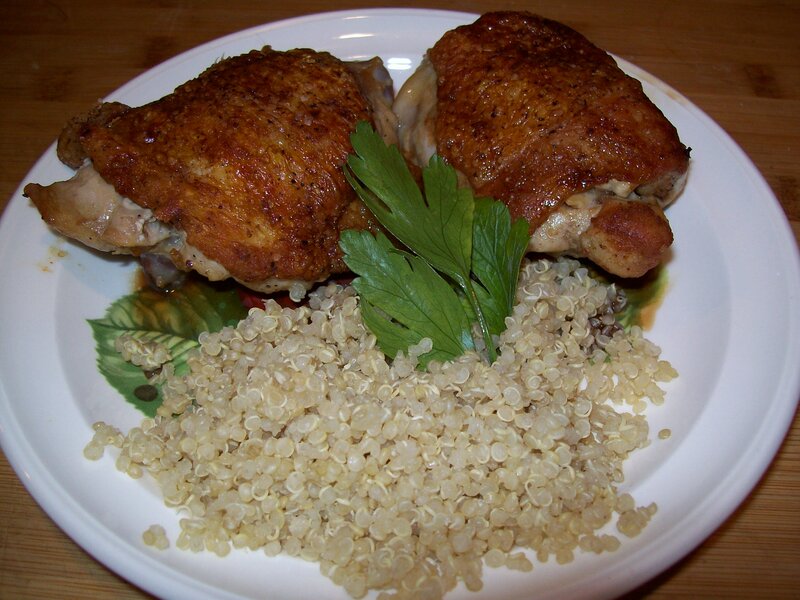 This entry was posted in Bird, Chicken, Main Course and tagged chicken, couscous, oven raosted, pan seared. Bookmark the permalink.